With the arrival of fall and winter, it is nice to enjoy some of the root vegetables that are more common to cooler weather. Carrots and their fair cousin—parsnips—are perfect for this. If you haven’t ever tried a parsnip, you are really missing out. 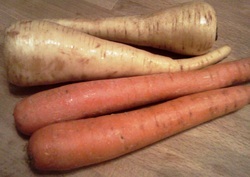 These sweet, pale tubers are similar in shape to a carrot but are more white—like most turnips. When roasted, both carrots and parsnips caramelize nicely, gaining a nice golden brown color and a rich, nutty, sweet flavor. They are a perfect side dish to enjoy with any meal. This is a very simple recipe and you can apply the same technique to almost any vegetable. 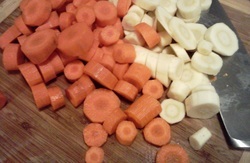 Peel carrots and parsnips, then cut into consistently-sized coins. Toss in olive oil and season as desired. Roast for about 15 minutes, stirring half-way through the cook time to promote even browning. * These are also excellent seasoned with lemon pepper, garlic salt, curry, or fresh herbs.